Installation view of Sam Durant and Kerry Tribe in Break in Transmission at the Holden Gallery, 2018. Image courtesy Holden Gallery, photography by Anita Kwiecien. The current exhibition at the Holden Gallery, Break in Transmission, explores how recent artists have examined the nature of communication by using the gaps, pauses, and breaks in language as means to produce their work. Works on display by Meriç Algün, Fiona Banner, Sam Durant, Shannon Ebner, and Kerry Tribe use the technologies of our networked modernity to show that contemporary communication operates more through breakdown and misappropriation than the frictionless exchanges we assume. In his catalogue essay Steven Gartside links this situation to the image of the test card, used historically to show continuity in analogue television signals during breaks in transmission; likewise, works in this exhibition demonstrate that gaps, misunderstandings and discontinuities can also prompt communication. 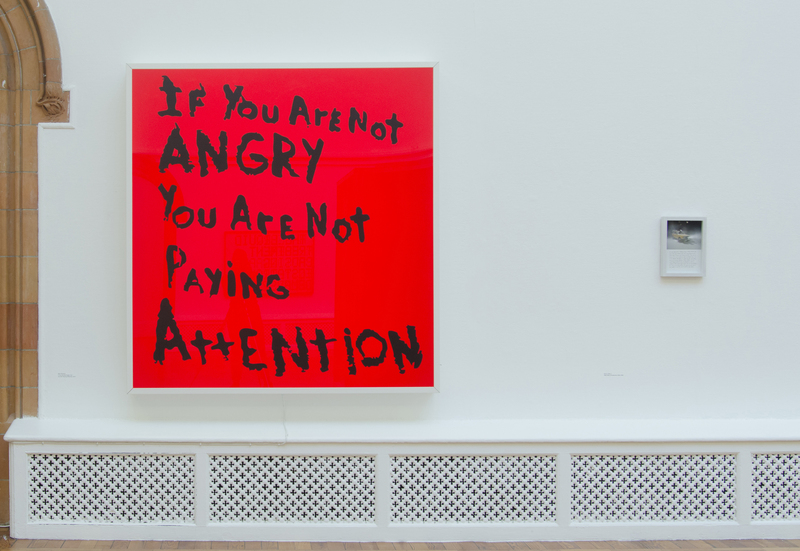 Sam Durant’s ‘Forwards Not Backwards’ (2017) and ‘If You Are Not Angry You Are Not Paying Attention’ (2017) present handwritten texts (sourced by Durant online) derived from political placards and re-contextualised on vibrant single-coloured backgrounds in two metre square light boxes. Durant takes personal statements of protest and filters them through the visual language of corporate advertising; the words take on an impersonal, official air, suggesting to the viewer how visual languages we assume belong to these different spheres are open to strategic appropriation. Shannon Ebner’s ‘Electric Comma One’ (2013) comprises a number of black and white photographs that show fragments of a poem written by Ebner and transcribed onto an LED sign. Here, Ebner highlights the tension between looking and reading. While the first photograph clearly shows the LED text, ‘DEAR READER COMMA THE TWENTY-SEVENTH LETTER OF’, the next image is barely legible, as it captures the moment of transition whereby one phrase (‘THE LIQUID TREATMENT CAUSING ECSTATIC DELAY’) is superseded by the next. Ebner’s work examines how structural components, whether the grammar of language or artistic medium, inform the significance a work has for its audience. Fiona Banner’s ‘Dear Contributor’ (2016), turns the humour of cartoons into a reflection on arrested communication. Banner’s print references an ongoing series of jokes from Peanuts that riff on Snoopy’s continually thwarted ambition to become a novelist. Banner prints a rejection letter received by Snoopy twice, the second offset from the first in a field of murky copier toner, in which letters interlock. We have to read the call to cease communication (‘Never send us another story’) through a mass of printed matter as the text dissolves into visual noise. Meriç Algün’s videos, ‘Infinity’ (2013) and ‘Eternity’ (2013), present close-up shots of hands undertaking repetitive acts of procrastination, wrought as a physical presence within the gallery on cuboid television sets. In ‘Eternity’, the hand plays with some string producing partially formed knots that resemble a Mobius strip, and in ‘Infinity’ the hand spins a pen, endlessly tracing the perimeter line of a circle. The work evokes a fidgeting paralysis endlessly repeating on the floor of the gallery. The unreliability of recall becomes the focus of Kerry Tribe’s film ‘Near Miss’ (2005), which re-stages different versions of a shot of a car veering off the road in a blizzard. Upon repeated viewing, variations in the action become apparent, just as a changing set of contextual factors can inform memories. Tribe’s new film ‘Afasia’ (2017) foregrounds the material basis of memory by examining the neurological condition aphasia; an impairment of language processing that often follows a stroke or head trauma. The work focuses on photographer Christopher Riley, who suffers from the condition, and examines how he has reconstructed the connection between his language use and the world around him. Tribe juxtaposes Riley’s English voice-over with images of the Mexican artefacts he discusses overlaid with their Spanish names. The film toggles between Riley’s account and Tribe’s own attempts to learn Spanish. The work foregrounds how translation as an act of transformation constitutes the links we form with the world around us. As we navigate the exhibition we encounter displaced or absent information, contradictions, and discontinuous repetitions, and we see how such breaks in communication also carry a productive force. Break in Transmission, Holden Gallery, Manchester. 22 January – 16 March 2018. Andy Broadey is an artist based in Manchester and lecturer in Contemporary Art, History and Theory at University of Central Lancashire.